Jewelry Bishop panagia (encolpion) - A528 (gold-gilding) - Istok Church Supplies Corp. 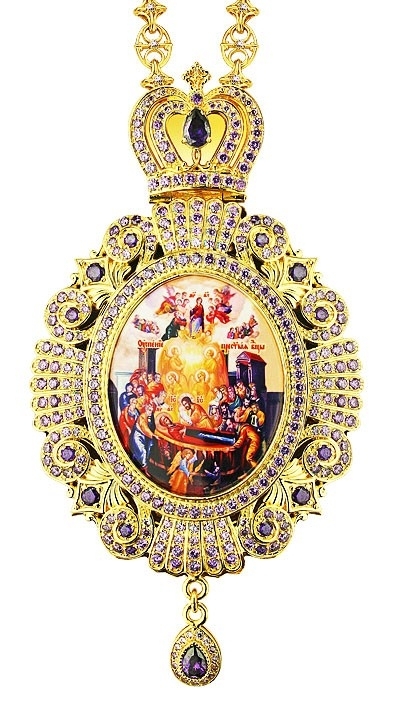 Orthodox Christian Bishop jewelry panagia (encolpion). Excellent Russian-made piece of art-work made of brass and covered with 24K 4 mkm galvanic gold-gilding. This technology guarantees durability and high quality of the coating. The icon is made using a special technology of applying a color image on a brass base. It is coated with a compound that protects it from mechanical damage and exposure to light. Custom-ordered icons are welcome. The icon's frame is decorated by a stylish ornament with a wreath of phianite stones of excellent quality The stones are attached by hand, which guarantees their being in their places for the entire period of wearing the item. Panagia is sold with a chain in a presentable man-made leather packing with a velvet lodgment. Size: 0.0''x0.0'' (x mm).